Yes, I know I’m wearing a suit. You know I'm a digital frog, right? Or why it took 20 Years to get published. On April 5th 1995 A Star is Born. No, not the '76, '54 or '37 movies... Yeah, more than one. Mind boggling, isn't it. Anyway, back to moi. I have an ego, get over it. Everything about me is big––larger than life. 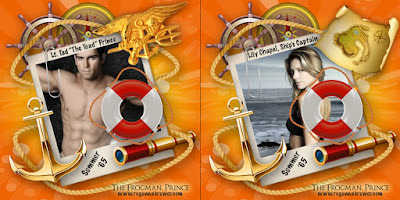 I started out as an over the top romantic parody of Grimm's fairy tale The Frog Prince. My author has this thing where she gives a character the book start date as a birthday. That's not to say the birthday ever comes up in the book. But it's the kind of insider information I like to share in my episodes. The Frogman, Prince is not the author's first effort, but was the first book she finished. Within a week of querying the editor of a popular romantic fairy tale line she received a phone call and a request for the full manuscript. A week later she received a call from an agent wanting her to deep six the romantic elements and take a male pseudonym to write Navy SEAL action adventures. But my author’s a romantic at heart and couldn’t imagine the story without the romance. It took her two years of writing through the Tonight Show with Jay Leno to finish the first draft. She submitted it to the requesting editor as soon as she typed "THE END" and went straight into the sequel featuring the Frogman's daughter. Somewhere in there she started critiquing and winning contests, which garnered her an editor appointment and a request for the full sequel. On June 1st 1998 she received “the real call” and sold her first manuscript––titled Puss in Boots. Published by Harlequin as SEAL It With A Kiss in April 1999. She then experienced what is commonly called the sophomore slump or second book syndrome. A meeting with her editor put her back on track. Probably not the track the editor had in mind. But our author managed to start another sequel. 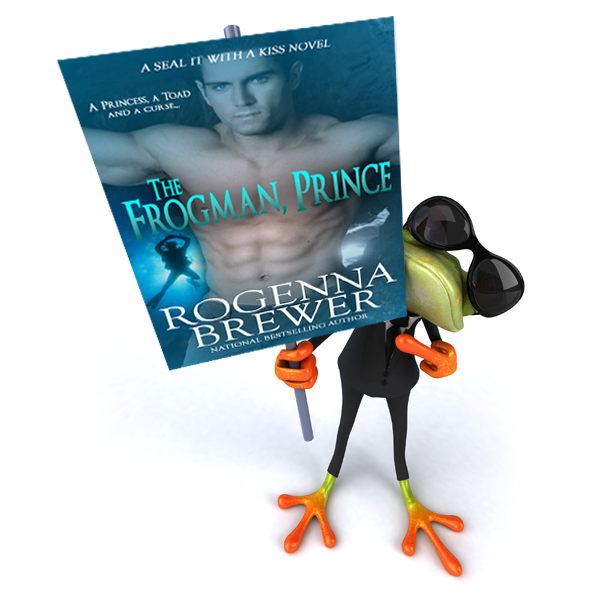 Meanwhile, after two years at another publishing house The Frogman, Prince was rejected. Let's face it... That first draft sucked. Besides which, our author was now under contract and barred from selling prequels, sequels and characters connected to her published works. And…gasp…her publisher wasn't interested in a prequel. You see The Frogman, Prince had been pushed into a black hole between Contemporary and Historical Romance by virtue of the daughter's story selling first. Our author either had to change the characters––which were intrinsic to the plot––or change the timeline. And no one was buying genre romances set in the 1960s. In 2000 she decided to upload a chapter a week to her website in order to fill the gap between her First and Second published books. Revising as she went, she didn't even realize anyone was following along until she missed a week and emails started flooding her inbox asking for the next installment. This was still the early days of the Internet. Self-publishing wasn’t an option. There were no "donate" buttons. Though many readers offered to send checks––she graciously refused. Her uncle––one of her biggest fans––convinced her to take Frogman down within days of that last chapter going up. Because he was afraid someone would swipe it. I swiped it in order to put it up on preorder, but I am THE FROGMAN, PRINCE and the author would never have finished my story otherwise. Every four years or so she’d pull out the manuscript and fiddle with it. It's gone back and forth between contemporary present day––whatever that date was––to contemporary 60s. At one point she gave in to desperation and even changed my name to Teague. Cool name, but it doesn't ring true for the story. My full name is Thaddeus, by the way. Thaddeus Miles Prince. But that, and how I came to be called "The Toad," all get explained in the book. Only Lily my love and Mitch my second in command call me Tad. And they do it just to piss me off. No one else has called me Tad since I was a tadpole––get it. And you know, despite the birthday and all, I'm forever 33––not 20, not 53––though I am in my fifties by the time my daughter gets around to becoming the first female Navy SEAL in her own book. In 2012, with self-publishing a reality, our author pulled out that initial publishing contract and realized she could get permission to use prequel and sequel characters even before she gets the those first three published books back for self-publication. And I guess if I have to be stuck in a time period the 60s are as wild as any. Under the cover of darkness, Toad braced himself in the helicopter’s open hatch, marking time as seconds ticked away. His flippers tipped close to the edge. Exactly the way he lived. Adrenaline pumped through his veins. Perspiration gathered beneath his wetsuit. He ignored the discomfort like a hundred times before. Flying low over the water to escape radar detection, wind-whipped backwash pelted his face as salty trickles ran into his eyes and mouth. Blinking back the sting, he scrubbed a gloved-hand over his stubbled chin. What the hell was he doing here? Time spent in a Cuban prison still echoed in his nightmares. He lived it. And he loved it. Flashing the pilot thumbs up, Toad leapt through the hellhole at the bottom of the craft. He splashed down hard and fast. Sucked into the black, wet void he kicked out in a couple powerful strokes. From air to sea, seven men followed his lead, and the CH-46 SeaKnight veered sharply left and then out of sight. In the eerie glow of chem sticks, he accounted for every last member of his team before fitting the breathing apparatus of the chest-mounted Dräger Lar-V to his mouth and setting a grueling pace for their two-mile ocean swim. The rasp of exertion filtered through the rebreather like some sci-fi creature on The Twilight Zone. When a murky shadow stirred the phosphorescent algae in his path, he reached for the KA-bar strapped to his thigh, but the hammerhead moved on as if sensing a far more dangerous predator in the water that night. Sixty minutes later, the frogmen surrounded their objective. The hull of the OSV Lily Pad measured two hundred and twenty feet from stem to stern. As his team bobbed silently in the water, Toad waited to give the man nearest to him the signal to board. Once issued the command would pass from frogman to frogman without fail. Thanks! Nice to see you here. I guess I am dating myself with this post. Oh, well, right ;?